I was on holiday last week. I thought it was high time I had a break from the craziness of life. And I needed a decent chunk of time to get some of my crazy projects done. I spent the first two days in Auckland, staying with The Big Sister. I took her some spare seed packets I had, thinking she might want to try them at some point. She wanted to try them right away. So impressed! The Big Sister is making good gardening progress. Since moving into her own house with The Big Brother-in-law and The Cutest Nephew, she has, with help from myself and her Mother-in-law, gathered a small collection of herbs and leafy vegetables, mostly in planters and pots. And she is really enjoying using the fresh herbs in her cooking. I’m so proud of my little gardening student! Naturally, we ended up at Kings Plant Barn, which is conveniently close to The Big Sister’s place. She bought some lettuces and coriander to replace her last lot. Then we used the seed tray and small pot from these to sow her some cherry tomato seeds and cucumber seeds. The Cutest Nephew was very interested in our gardening foray. So was the wind. The next day I did some gardening for The Big Sister; tidying, trimming and weeding. I was all set to crack into the weird overgrown vege garden they have inherited, hiding in the back corner. However, I discovered that the mound of soil, covered in weed mat, happily growing weeds, mint and thyme, is all sitting on a thick plastic sheet, which is sitting on concrete. Oh, what? And oh, darn. That ‘aint how you make a garden bed! Naturally, I suggested the creation of a raised bed on part of the lawn instead. I don’t think The Big Sister is as excited about that prospect as I am. We’ll see. I almost finished knitting the second square of my rug too. The next day I was back in Hamilton and I spent a large part of the day doing a busy gardening job for a friend. This was great exercise after my crazy-spring-weather-imposed lack of outdoor activity. But seriously, how many times can it rain off and on in one day? Over a week? It was like that in Auckland too. When The Big Sister, The Cutest Nephew and I ventured into their back garden on Monday, we got trapped in a sudden shower behind a locked gate, blown shut by the wind. I scaled the fence and saved the day. But not my pants. Anyway… after all this time spent on other people, my holiday time was starting to disappear. And I had a wedding on Saturday. It occurred to me that I wasn’t going to get many projects done after all. While I was on a mid-week gardening roll, I did manage to weed the bluebell garden later in the afternoon once I had finished the friend’s garden. Then I was a blob for the rest of the evening. When Thursday rolled around I just wanted a sleep-in and a blobby morning. That doesn’t sound very productive. But I did some important research from my lofty position on the couch. I discovered recipes for how to make coconut milk (both from whole coconuts and from dessicated coconut), how to make coconut oil (I want to start using it but it’s so expensive) and how to make ghee. All of these were exciting to me, but the thought of making lactose-free ghee from butter to use instead of vegetable oils and margarine is the most provocative. After my blobby but thought-provoking morning, which stretched into the afternoon, I did the grocery shopping, bought some cocoa butter online (to make my own chocolate) and sowed some seeds for the vege garden. I thought I better at least make some contribution to the garden that day. I sowed capsicums, celery and rocket plus Nasturtium ‘Top Flowering Black Velvet’ (Tropaeolum minus) and Meadow Foam (Limnanthes douglasii) for some pest control in the vege garden. 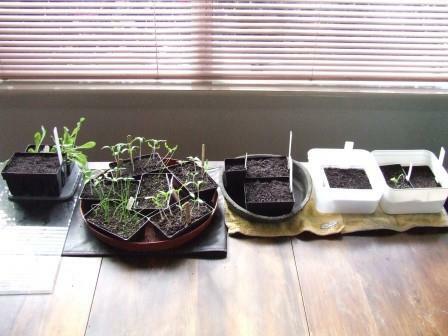 This means there is a growing population of seed trays on the dining room table. And I haven’t finished sowing yet. I just need to get some hole-less trays! As Friday approached I realised I had somehow gathered more projects instead of getting projects done. Ah, I am doomed to be a project nut for the rest of my life! Well, I don’t think I will ever be bored again. I have been filling up my computer desktop with sticky notes about what I want to do and get. I began Friday morning by going to the secret nut sale. I arrived later than last time but still managed to bag some excellent bargains – sesame seeds, linseeds, dried apricots, wholegrain oats, coffee beans and a dried fruit and nut mix for snacks. After this excitement, and the mandatory calculating of my savings, it was time for some mandatory house cleaning. This was made a bit more exciting by my first foray into homemade cleaners – bathroom disinfectant and laundry detergent. The afternoon found me researching essential oil suppliers in a quest for additions to my homemade cleaner stash. There are far too many places to buy essential oils! I decided to think on it. Then I went outside to face the weeds in the carport garden. They had assembled into a great army. They weren’t very big and none of them had set seed, but they were taking over with sheer numbers. A closer inspection revealed that violets were the main force. I love violet flowers, but I don’t like the invasive plants. I attacked. Not far in, I toyed with the idea of surrendering, or forming some sort of truce with the violets. Maybe they could have part of the garden bed? Then I came to my senses. They were never going to honour a truce. They would take it all! Though I was vastly outnumbered I fought on bravely until the bitter end. I will not tell you how long it took. Then I rejoiced in my victory by smiling smugly to myself and taking a photo. Saturday was wedding day. The Husband and I had been enlisted to the set-up and pack-up crew for our friends’ ceremony, which meant we had to be there at 9:30am. It was to be an outdoor ceremony, followed by an afternoon tea, with numerous bits and pieces to be done, including hanging up many buntings, setting up tables and, my favourite part, getting creative with foliage and glass jar table decorations. I planned to take some photos of the decorations after the ceremony. The ceremony was very sweet and genuine. But part-way through I had a crisis. The camera batteries were suddenly almost out. Someone had taken the spare batteries out of my bag at some unknown point and put them in some unknown place. And it wasn’t me. This is a good way to infuriate a Twiglet. Fortunately, I got to take a photo of the wedding kiss, then I was out. So no decoration photos. I suppose I did get more time to just enjoy everything though. Afterwards, we bought some batteries. The reception was a lot of fun and rather emotional. So much love for and from these guys! By the time we got to bed it was after midnight, but it was actually 1am because of Daylight Savings. Argh! There’s nothing like a good wedding. Sunday, sleepy Sunday. I hate the Daylight Savings changeover, but love having extra daylight hours once my body adjusts. I felt like a zombie through most of church on Sunday. I wasn’t much good for the rest of the afternoon either. We did a little shopping, mostly for The Husband, who had been scolded for wearing an old, huckory pair of pants to church and his work boots, which were a repeated offence. He now has some new jeans, thanks to SaveMart (oh, how I love you, SaveMart) and some nice new shoes. That evening, the world just about stopped turning when Mr Whizzy died. The Husband was making peanut butter when the blade plastic just started melting everything together. Seriously?! Not another food processor! We’ve only had Mr Whizzy for 2 months. So much for his great Consumer rating. I wasn’t so much sad as I was annoyed. Now we have to start researching and forking out money all over again. Pooh sticks. After writing this last night, I discovered an apparently decent food processor on sale at Briscoes for half price, finishing that day. It was recommended by someone who also had their Mr Whizzy cousin die. Since it was already late at night I purchased it online, with just an extra $5 delivery fee. Now we just have to take the old one back and wait for the new one to arrive. It better be a good one this time! It will be put through its paces from an early age. If it fails, we’re going to have to step up our game. Is it time for my next holiday yet?